As the UK hosts a summit on the state of medical cannabis in Europe, BBC Reality Check asks - does Britain really export more legal cannabis than any other country? Pro-drug reform campaign group Transform says the government is denying that cannabis has medical uses while at the same time overseeing "the world's biggest government-licensed medical cannabis production and export market". There has been controversy over two boys whose families want them to have legal access to cannabis-based products that are currently illegal in the UK. Six-year-old Alfie Dingley and 12-year-old Billy Caldwell both suffer multiple seizures every day because of rare and treatment-resistant forms of epilepsy. It's true that the UK was the main producer and exporter of cannabis-based medicines in 2016, according to the UN's International Narcotics Control Board (INCB). The majority of it ended up in the US. Virtually all of that is one drug - Sativex - which is licensed to treat muscle stiffness and spasms in people with multiple sclerosis. Sativex is available throughout the UK but only provided free on the NHS in Wales. The Home Office says it doesn't define it as cannabis and that the UK doesn't export any cannabis in its raw form. Cannabis, along with many of the more than 100 chemicals it's made up of, is a controlled substance - possession and supply are punishable with fines and imprisonment. 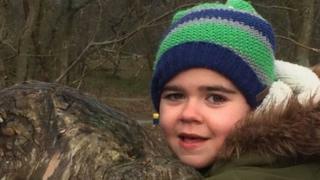 The family of Alfie Dingley want permission to use cannabis oil from the whole plant, which they believe will work better than any legal alternative. Cannabis is also being grown legally in the UK for another medicine, Epidiolex. It's currently being reviewed for the treatment of two rare forms of uncontrollable epilepsy, by medicine agencies in both the US and Europe. But it's not yet available. The specially bred type of cannabis plant used to make it is grown in a glasshouse in Wissington, Norfolk, by British Sugar - which also grows virtually all of the sugar beet in the UK. British Sugar - whose managing director is Paul Kenward - has an exclusive deal with pharmaceutical company GW, which makes Epidiolex. Mr Kenward is married to drugs minister Victoria Atkins. She was accused of "hypocrisy on a grand scale" over her husband's involvement in a legal cannabis farm. She declared the interest in Parliament when she was appointed in 2017 and excused herself from speaking for the government on cannabis.